From Ukraine to Gaza, international crises are currently dominating the news. So the latest round of The Economist’s ongoing survey of American public opinion on foreign affairs is particularly relevant. What really stands out in this survey is how detached young people are from what’s going on in the world. The convention is that millennials are idealistic, hyper-connected global citizens. The reality is that many of them just don’t have an opinion. People aged 18-29 are 53% more likely than people over 30 to answer ‘don’t know’ or to have no opinion on a range of questions about the big foreign policy issues. The survey covers 25 questions on topics ranging from Israel to Egypt to Ukraine. On average, 33% of millennials had no answers, compared to 21.6% of over 30s. The millennial ‘don’t know’ bloc is spread across issues. Young people are less likely to have an opinion on head-scratching dilemmas such as whether they approve of President Obama’s handling of the crisis in Ukraine. But they’re also less likely to have an answer to basic emotive questions: 51% claim to have no positive or negative opinion of Hamas, almost half are neither hot nor cold on Benjamin Netanyahu. They’re also less likely to know the answer to widely reported, undisputed facts: 41% didn’t know who had experienced most of the civilian casualties in the fighting in Gaza. Sure, there’s a basic civics case that young people should follow international affairs more closely. But there’s a self-interested case too. The consequences of foreign policy play out over generations. The instability in Iraq has its roots in borders drawn carelessly in the 1920s, while Afghanistan’s instability comes from the involvement of superpowers 30 years ago. Millennials will live with the consequences of today’s decisions for longer than retirees. And, if things really go wrong, the country sends its 18-29s into battle. 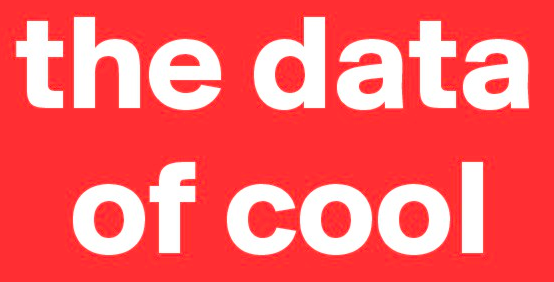 In the light of current world events, we’re going to bend the definition of the data of cool for this particular post. It turns out that the secret to tolerance is familiarity. Pew Research recently ran a typically excellent survey about religious tolerance in America, asking people the revealing question how warm they felt towards other religions on a scale of 1-100. Hiding in the data is the significant difference of opinion between people who know someone of another religion and people who don’t. If you know someone from another religion, you’ll feel an average 60/100 on the warmth scale towards that religion. If you don’t know someone from that religion, you’ll feel an average of 44/100. So Americans feel 36% warmer to other faiths when they know someone of that faith. There’s a similar familiarity gap for big groups, such as Evangelicals, for smaller groups, such as Buddhists and Jews, and even for atheists. In other words, love thy neighbor. We have the data to prove it. Does Barry Diller Own The Keys To Our Hearts? Two remarkable data points show the influence of online dating, and how online dating is concentrating in the hands of a few powerful businesses. Last year, a University of Chicago study found that 35% of couples who married between 2005 and 2012 had met online. And today, Barry Diller’s media conglomerate IAC announced that it was buying dating site HowAboutWe, adding to its portfolio of Tinder, Match and OKCupid. AdAge estimates that the deal gives IAC a 28% share of the online dating market. 45% x 28% = 9.8%: Barry Diller now creates one in ten American marriages. How Is A Football Shirt Worth $1.28 Billion? Adidas today announced a ten-year, £750 million ($1.28 billion) kit sponsorship deal with Manchester United. The deal dwarfs the previous biggest kit sponsorship agreement, Adidas’s £31 million a year deal with Real Madrid and Nike’s £40 million a year deal with France’s national football side. Let’s see how the club’s sponsorship deals add up. All data is annual. It more than doubles the club’s current £23.5m a year kit deal with Nike and £25m a year shirt naming deal with AON. For context, that £143 million amply covers the annual wage bill of star players Wayne Rooney (£16m), Robin Van Persie (£10m) and Juan Mata (£7m) and, more importantly, the £71 million annual financing costs left from the Glazer family’s controversial debt-laden takeover of the club in 2005. What’s in it for the sponsors? AON claims its brand awareness grew from 39% to 50% during the first year of its shirt sponsorship. Kit manufacturers get brand exposure, and also revenue from lucrative replica kit sales. Fans buy an average of 1.4 million Manchester United shirts a year, putting it in an elite bracket of clubs that sell over a million shirts a year. Real Madrid also sells 1.4m, Barcelona 1.15m. Superstar players can spike that figure. Real Madrid claimed to have recouped the £80 million ($137 million) cost of buying Cristiano Ronaldo in 2009 by selling 1.2 million Ronaldo 9 branded shirts in the player’s first season with the club. Perhaps the figure that will matter most in the red half of Manchester is that Liverpool FC’s kit deal is worth £25 million a year, while the Merseyside club sells around 800,000 shirts a year. What Is The Most Hipster City In America? Hipster is a label that everyone applies to others, and no-one applies to themselves. 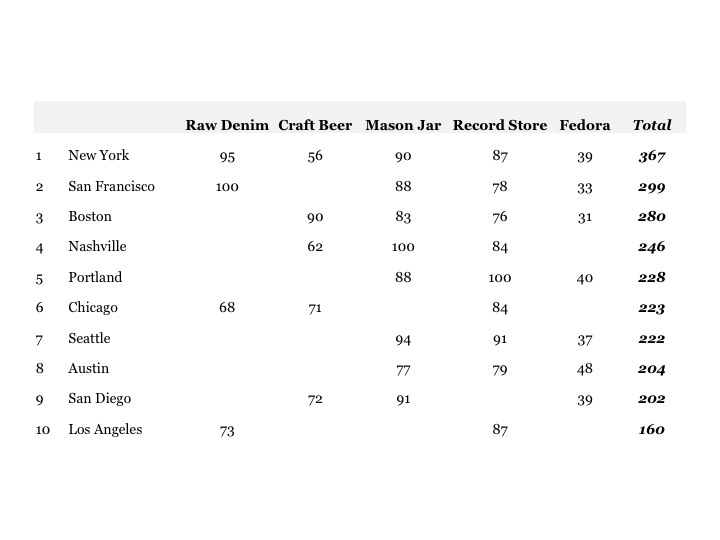 However, there are signifiers of hipster culture and lifestyle that everyone recognizes, and we can use the popularity of those signifiers to identify the most hipster cities in America. 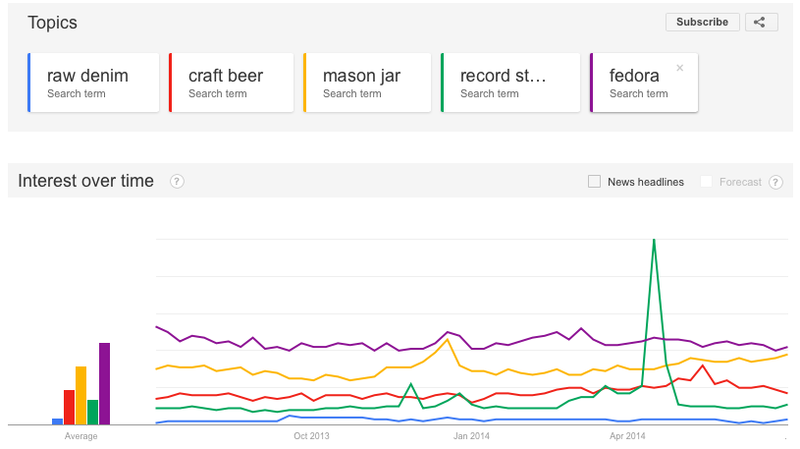 Let’s take five common signifiers of hipster lifestyle – raw denim, craft beer, mason jars, record stores and fedoras – and see where search volume for them peaks. That could give us the hipster hotspots of America. Added together, the search volume gives us a picture of America’s most hipster cities. So New York tops the table, followed by San Francisco. Boston is a surprise third. Nashville’s love of mason jars and record stores earns it fourth place, while Portland’s love of record stores (remember Portlandia’s DJ Night sketch?) takes it to fifth place. Google doesn’t separate New York’s search volume down as far as Brooklyn, but we’re sure the New York Times will attempt to do so. 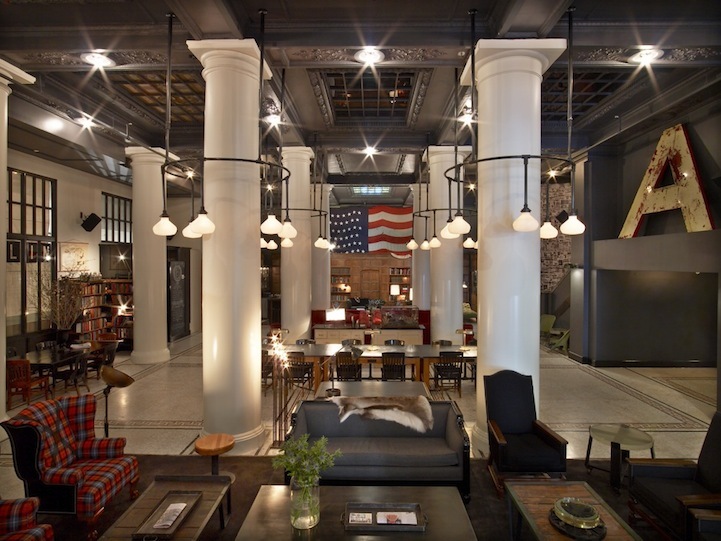 How Big A Business Is The Ace Hotel? The key metric for the hotel industry is RevPAR, meaning revenue per available room. $110,000,000 / 1,045 rooms / 365 days = $288 revPAR. That’s impressive, considering that the typical RevPAR for US boutique hotels is $157. No doubt the businesses operating out of the Ace, such as Rudy’s Barbershop and the Michelin-starred Breslin restaurant, are boosting the revenue. The Ace is opening further hotels opening in Pittsburgh and New York’s East Village next year. 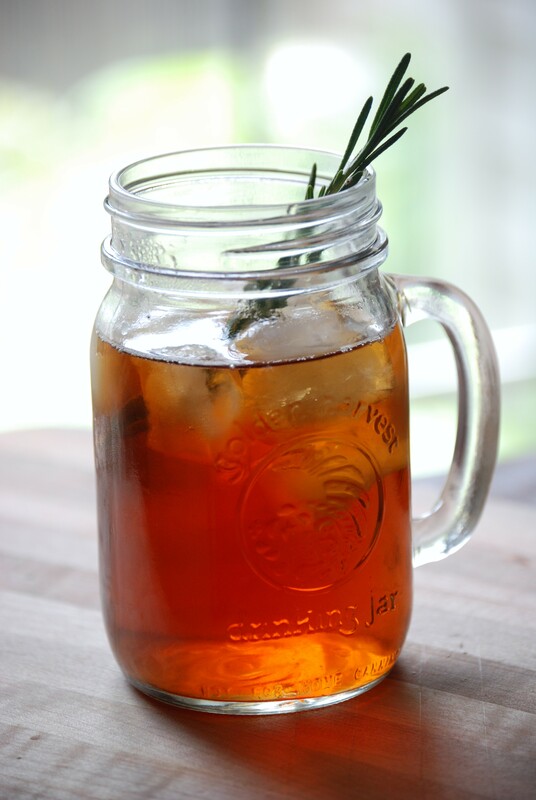 We’ll aim to list some other hipster businesses with $100 million revenue in a future post.